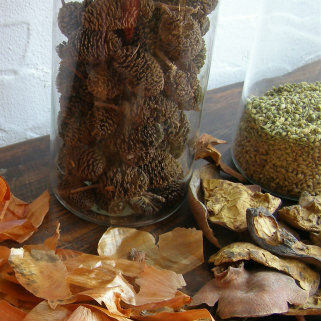 nono-craft uses Japanese traditional natural dyes, such as grasses and leaves, roots, flowers, skins of nuts, and tree barks. 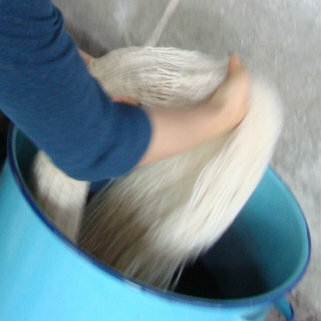 The works is characterized by the clear and delicate colors, which differ from the popular image of austerity and dark colors that natural dyeing has. nono-craft carefully selects the dyeing process as environment-friendly as possible. “nono” is the pseudonym, nono-craft, means “fabric” in an ancient dialect of northern Kyoto, where I studied the traditional Japanese dyeing. “nono” embodies my works, i.e. dyeing the threads and cloths, sewing, weaving, spinning yearns, felting, expanding the possibility of fabric.It is nono-craft’s aim to bring out the beauty in each person by wearing the colors. 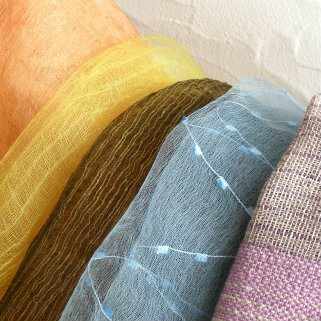 nono-craft is established by Miyuki Oka, Japanese natural dyeing artist. I have aspired to become an artist who creates something beautiful with my own hands. After working for a trading company as a salesperson, I studied orthodox techniques of dyeing, chemistry, design, and weaving at Kinki Polytechnic College Kyoto. While in college, I worked as an assistant to a Japanese traditional kimono artist on the weekends. I also learned Indian Indigo and Indian Batik, a traditional dyeing method with many processes, in Jaipur, India. After graduation in 2000, I opened her own studio in Karuizawa, Japan. nono-craft exhibitions are held every month in various locations in Japan, such as in Tokyo, Kyoto, Yokohama, Nagano, Karuizawa, and so on. nono-craft searches and learns new techniques of natural dyeing and weaving. At least once a year, I goes abroad and visits dyeing workshops and studios to master their skills, to exchange knowledge, and collaborate on projects. I have visited studios in many countries, including Mexico, Peru, Argentina, Sri Lanka, Indonesia, Thailand, Finland, Latvia, Estonia, Bulgaria, Romania, and Morocco. The dyes nono-craft dyes uses are Japanese indigo, madder roots, logwood barks, walnaut husks, pomegranate rinds, flowers of flame- of-forests, buds of Japanese pagoda tree, and so on. Some of these plants came to Japan from Persia or India via the Silk Road, and some others are indigenous to Japan. They have all been used as medical herbs, and are non-toxic. They were highly valuable. But to modern people, they do not apper as something valuable at all. Yet, nono-craft brings out clear and delicate colors from their lackluster. I wish to share the unexpected beauty and wonder of nature. Since ancient times, Japanese people have enjoyed the sensitive differences of many layers and hues. The folded different appear much enriched from a distance like stipple paintings. This is the beauty of Japan which has been cultivated in its climate and history. nono-craft describes the traditional beauty with respect for the orthodox methods and ancient wisdom which has handed down to me. Each factor of nono-craft has a unique story. They have been through similar but different processes. Depending on the weather or conditions of the materials, even the finished colors are not the same. Each of them speaks of the treasure of devoting time and effort to beauty. It is my wish that you will interpret and enjoy the story.